Doormerica produces a complete line of interior aluminum door frames and window wall configurations for commercial applications. Serving the entire nation from our Sacramento California Architectural Components manufacturing facility with wall sizes up to 11-1/8". We offer anodized and paint finishes, two unique doorstop profiles, four trim options, and some of the fastest lead times in the industry. Fire certifications available on certain frame options. 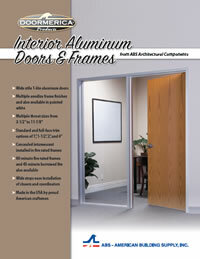 Providing for all of your commercial aluminum door frame needs since 2006.